"Fostering a Culture of Caring, Not Just Curing." The doctors and staff of Zionsville Animal Hospital would love to meet you and your four-legged friends. We extend a warm welcome for you to visit our hospital and let us help you with any of your pet’s needs. Is your pet experiencing an emergency? 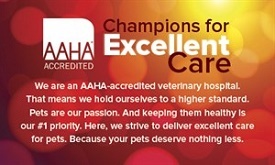 OUR MISSION is to provide our patients with the most modern, high quality, compassionate veterinary care, exceed our clients’ expectations, and provide our employees with the opportunity for personal and professional growth. We pledge to maintain a state of the art facility, employ highly trained and compassionate health team members, educate the public about the benefits and responsibilities of pet ownership and expand our knowledge and capabilities. Zionsville Animal Hospital is a full service animal hospital catering to both dogs and cats. We offer everything from preventative healthcare and emergency services to dentistry. You will also find quality cat and dog boarding facilities here at our Animal Hospital. It may put your mind at ease to know we are a Certified Cat Friendly Practice as well. We take the stress out of bringing your cat to the vet! We offer special exam rooms dedicated to our feline friends. We also have cat friendly waiting rooms free of excessive noise, commotion, and smells. Click here for more info on our Cat Friendly Practice! We also have 2 other locations a bit south of us - if you need an Indianapolis Veterinarian then visit Michigan Road Animal Hospital @ 96th Street or at Crooked Creek. All of our locations are here to serve you and your pets! Thank you for visiting our website. We hope to see you soon. "I would definitely recommend Zionsville Animal Hospital to anyone looking for a good caretaker for your animals. :)"